- 3 Mobile Phones with 3 lines including unlimited calls to all Sun Subscribers. - Unlimited text messaging to Sun, Smart and Talk n Text subscribers with 750 text messages to other networks. 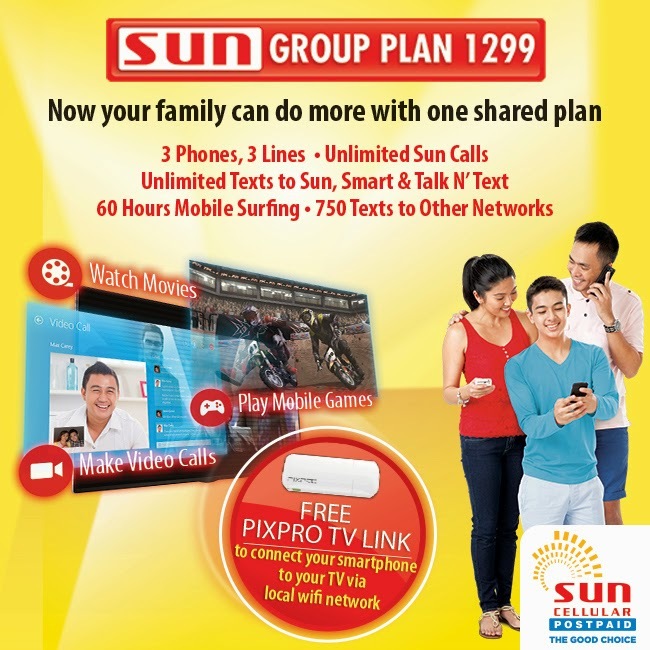 The Sun Plan 1299 also comes with 60 hours of data and a free Pixpro TV link. The phone options are the Samsung S Duos 2, 0+8.91, Acer Liquid Z5, Alcatel Scribe and the Huawei Y600. I used to have this plan few years back. Thinking of getting another one for Mom, my brother and myself. Good Deal right?! So what are you waiting for? Apply now here!